Like with the Indian traffic, you don't want to get stuck with the Indian spinners. Perhaps the worst thing a batsman can do in India is not look to score off the spinners, and letting them bowl where they want to. It is conventional wisdom: you just don't let the spinners boss you. Once the runs stop coming, forward short leg, silly point, slip, leg slip, all sorts of close-in fieldsmen surround you. No matter how hard you concentrate, one of those deliveries will jump at you sooner or later, or turn a touch more than expected. And boom, with not many added to the scoreboard, the concentration to bat out sessions comes to nought. Matthew Hayden swept viciously, Adam Gilchrist attacked ferociously, Michael Clarke used his quick footwork to upset the rhythm - most of the recent Australian batsmen who succeeded in India did so by bossing the spinners. Perhaps it is an acknowledgment of a much weaker Australian middle order, and a case of them having no illusions about it, that they have taken the patient route, one that calls for endless concentration and application, and involves disproportionate rewards in terms of runs. If on day one it was Shane Watson defending for dear life, Tim Paine on day two didn't leave his crease, didn't play the premeditated sweep, didn't manufacture cuts or pulls, but defended long enough to capitalise on the loose balls and take Australia to a fighting total. Paine is a smart wicketkeeper-batsman from Tasmania, Australia's cricketing backwater. He was marked as one for the future at 16, when given a Cricket Australia juniors contract worth A$10,000. Nine years later, he is playing in only his third Test, and will - in all likelihood - have to relinquish the gloves when Brad Haddin is fit. He is well aware of the wicketkeeping curse in Australia: Gilchrist had to wait for a long time for Ian Healy to leave, and Haddin had to wait for Gilchrist. During those years of wait, it would have struck Paine, a solid, slightly wristy but not powerful batsman, that introducing power-hitting to his game might fast-track his rise to the Australian national side. Paine has resisted that temptation. Sounds like just the guy to play the innings he did, 92 off 196 with the tail for company, an innings that involved resisting temptations of going for release shots, an innings that involved cramps, an innings that involved knowing he would have to keep wicket almost immediately after he got out. It was also a clever ploy. Australia knew that with Ishant Sharma coming back from an injury-forced break, India would have to make do with three bowlers for more than half of the day. They knew they had made those three bowlers work hard on day one too - as Harbhajan Singh later said, he ended up bowling "50 overs on one leg". Those shoulders and fingers would tire at some point. Until then, Paine kept alternating the strike playing from within the crease, occasionally playing the paddle to capitalise on a pretty square fine leg. Even though Watson perished to the inevitable ball that jumped, Paine waited for the bowlers to tire. He later spoke of the hard work involved. "It was as hard as I have had to fight," Paine said. "I think when I was on 9 or 10, it felt like I had been there for ever. And it was hot, and I was finding it really hard to score. They were bowling really well." Of course Mitchell Johnson's cameo helped. It brought Paine out of the shell a bit. 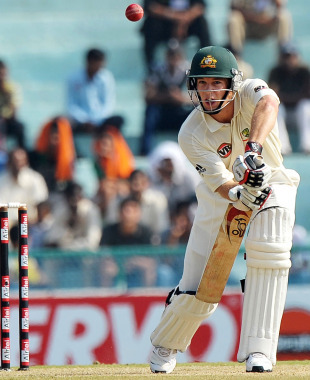 "Mitch is, I suppose, a bit under-rated with the bat," Paine said. "When he is in good form, he is as good as a batsman, and he scores his runs very quickly, which today took the pressure off me." With the tail in, Paine assumed more control. India couldn't take the new ball because Ishant still hadn't done his time. The old ball that went on for 146.5 overs stopped bouncing alarmingly. As expected, the loose balls started arriving. Paine could now play more strokes. And he did, the leg-glance and the late-cut standing out. Although it took him three attempts to get Paine's name right, Harbhajan didn't have to struggle to find praise for Paine's patience and shepherding of the tail. The most impressive aspect of the innings, perhaps, was that he didn't worry too much about tiring himself before going to keep wicket. He was on the field practically for the whole day. Paine the keeper hardly suggested that Paine the batsman was starting to get cramps towards the end of his innings. About the keeping, Paine enthusiastically spoke of the need to stand closer to the stumps, preferring to drop the odd catch rather than letting it fall in front of him. Solid as Paine was, Australia needed shock blows from Johnson - both with the bat and the ball - to edge slightly ahead by the end of day two. The team, though, let The Kid - a nickname Paine has earned because of his kiddish looks ("I haven't aged too much") - lead them off the field. He might have lost out on the feeling a Test century brings, but the pats on the back were well earned.